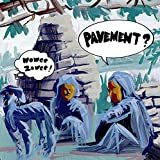 After two flawless records, it must have been hard for a band like Pavement to decide which direction to go next. They decided to go the weird direction... not that's necessarily a bad thing. 1995's Wowee Zowee is still a decent record, but where Slanted & Enchanted and Crooked Rain, Crooked Rain had moments of zaniness, the songs were still connected. That's not always the case with Wowee Zowee. It's still a good record, just not where I would recommened a new fan looking to get into the band to start.